More overnight rain & a dodgy forecast. 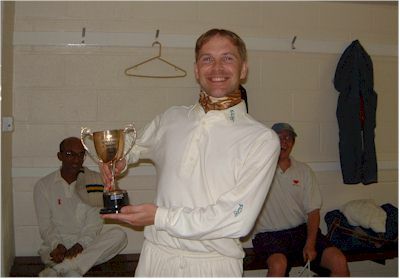 A toss no one wanted to lose & holders' Captain Paul Attwood had no hesitation inserting once he won it. P 147-8 P Hollman 20. N Johnson 9-5-16-3. A further 25 minute delay for the pitch to dry out followed but once the batsmen made it to the crease they soon departed with the exception of Leigh Adams (22) who played with patience & determination. Darryl Roberts in particular relished the conditions exploiting good lateral movement & the fielders backed it up. At lunch 86-5 was already a good recovery but Jamie Ward now in the middle found an excellent partner in Bolsom (39) making his highest score thanks to finding gaps at deep point that did not seem to be there. With Ossach chipping in with 22 not out & a substandard post lunch fielding display , 5 catches went down before the 10th wicket fell to Alexander. Paul Attwood could still afford to be pleased to bowl them out in under 66 overs for a score under 200. In reply, the UCS seamers of Jamie Ward & Valler did well - the latter picking up Holliday (8) with a flyer off a length just catching the top of his handle & ballooning up to the keeper. Hollman & Campbell continued cautiously until when an exploratory last over of spin before tea from Nick Ward picked up Campbell (14) stumped down the leg side by Bobby Abel & the balance & momentum headed to the Cricklewood side. Nick Johnson's field placings continued to strangle & stifle, & wickets fell as batters continued to try to break the shackles. Johnson himself kept the pressure on, & the big hitters Marshall Roberts & Rees all fell to catches at slip or mid wicket. There was no where else to go for Pacific & with UCS not quite having enough to extract the determined defence of Attwood & Alexander, the Captain's shook hands. UCS the moral victors, Pacific the retainers of the trophy. Captain Paul attwood said afterwards "Felt mentally and physically exhausted yesterday after UCs. I have never felt so nervous as facing those last few overs!!" 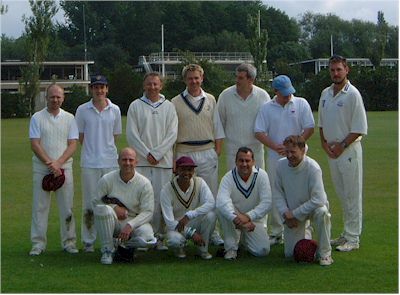 P: M Holliday P Hollman J Campbell B Hardisty H Patel T Marshall D Roberts S Rees M Alexander P Attwood*+ I Lay.